As a book-gobbling reader myself, I find I am drawn, in fiction, to the books that take me elsewhere in time and place, whether it be to the stars in science fiction, to Viking raids or English court life in historical fiction, or realms of dragons and elves and magicians in fantasy. After reading the Narnia series as a child, I carefully searched the backs of closets and jumped into promising puddles hoping against hope that I might find a strange land I could visit and experience myself. I knew it was fantasy, but the yearning to go elsewhere has always burned strong in me. As a high school student, I no longer searched through closets for overlooked fantasy realms, but rather pored over exchange student brochures looking for a way to get overseas. I wanted to go to Norway, where my Viking ancestors hailed from, or France, where Eleanor of Aquitaine had galloped across the countryside fleeing her enemies, or Japan, where the noble samurai lived. As you can see, I probably needed a time machine as well, to get to the interesting times as well as places. I was fortunate enough to win a scholarship to live in Japan for a year, studying at a Japanese high school and living with Japanese families. (Thank you, Rotary Club!) I returned to Japan after college and worked there for several years as well, for although the samurai I had once sought were not running around anymore, I had fallen in love with the people, culture and history of Japan as it is today in modern times. I believe writers create what they most love to read, and so I have created for you what I love, which is a story that takes you to a different time and place and experience of the world. Specifically, a way to visit the Japan I love without all the stress and expense of travel. A Japan as it might have been, if steampunk dirigibles had been available to the samurai charged with defending Japan from foreign invasion. A Japan where loyalty and duty and sacrifice and tradition meet innovation and rebellion and vision. A Japan set in the 1850s, but which deals with not only the struggles and challenges of that time but also our own time. Now, perhaps you simply are not interested in Japan. My best friend and fellow writer is not interested in Japan, so I know this is possible. I can, with difficulty, imagine this possibility for other people as well, that you would not be interested in learning more about a unique country whose people are descended from the Sun Goddess. Whose royal family has ruled, without interruption, for over 1,500 years, as the oldest continuous hereditary monarchy in the world. A people who found the will and strength to go from an agrarian and feudal society to an industrialized imperial power in a single generation when they collided with the West in the 19th century. Whose samurai ethos has inspired a thousand stories of loyalty and duty and noble sacrifice. Whose ancient arts and poetry inspired our own artists a hundred years ago, and whose modern technology, fashion, design and literature have touched our own culture in so many ways in recent decades. I suppose this is possible. Maybe. Sad, very sad, but possible. This author does not matter a bit, whether you know of Stephanie R. Sorensen or not, but stories and experiences do. So if you love universal human stories and an opportunity to explore a different time, place and culture, give “Tōru: Wayfarer Returns” a try. 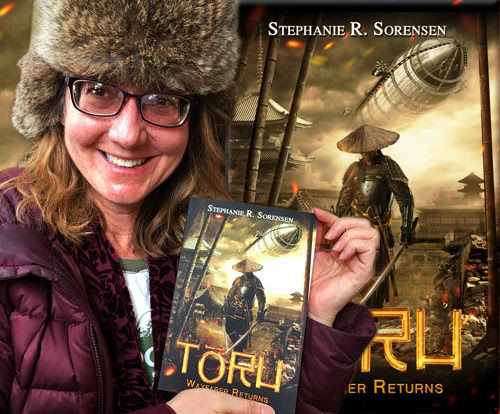 Thank you so much for hosting my guest column today and letting me tell your readers about "Toru." I had to laugh because you picked my "author in the wild" picture up from the very bottom of my blog posts, hidden away, not my beautiful glamour shot at the opera. That's okay--'tis a truer picture of yours truly. I wear that hat around town in Leadville, Colorado (elevation 10,000 feet) from November to May as I slog through snow up to my waist. Thanks again! Living in Japan must have been very cool! This book sounds wonderful! Thanks for hosting.